For those expecting a spin-off featuring the fem-bot behind the man-bot known as Optimus Prime, heading up a fighting team of fem-bots defending the universe and that, then be prepared to be disappointed. It may have futuristic themes, but this isn't that type of film, for better or not. This adaption of Jordan Harrison's 2014 play of the same name, is set around a family who introduce technology in a bid to keep an elderly member engaged with life. I know i'm not playing Don Draper, but if I were, this chick would be too old. Just. 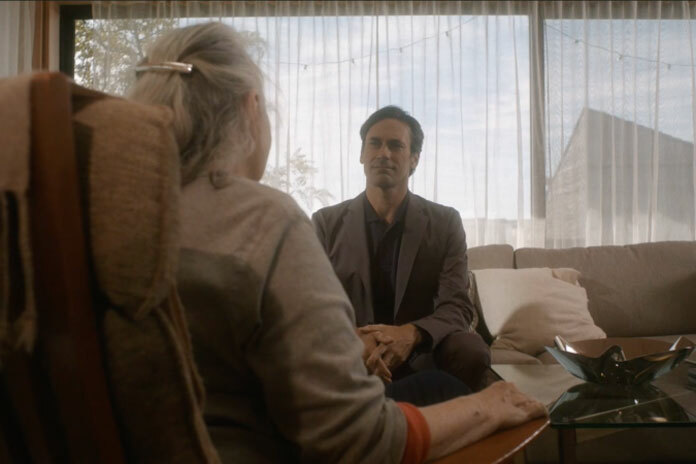 Feeling that her mom Marjorie (Lois Smith) might be a tad lonely in her old age, daughter Tess (Geena Davis) pays a company to provide a holographic projection version of her dad, to keep her mother company. As the older version was apparently unattractive - according to Marjorie's son-in-law Jon (Tim Robbins) - a youthful version of Walter (Jon Hamm) is chosen, considered to be the most aesthetically pleasing version of the real thing. With Jon informing this techno version of Walter of his relationship with Marjorie, he is armed with enough background to recall events in their shared history to spark Marjorie's own memories. From the off it is clear that this originated on the stage, as director Michael Almereyda does little to change things up, cinematically at least. The story, for the most part, takes place in one house, making it feel both staged and stagnant. And whether deliberate or not, both could also be said of the performances. If this was a song, it would all be sung in the same note, with no variation. Hamm can be excused for his robotic delivery, essentially as he is playing a computer program with the ability for its AI to learn about its subjects. The rest of the cast can't be let off the hook though for their dreary deliveries. Considering that at the centre of this piece is a story about family, aging and loss, it is completely bereft of emotion. There is no rage, no tears, no nothing. The only one who comes out of it with a modicum of humanity is Smith, with a gentle and touching performance. It's a real shame considering the rarity of seeing the likes of Davis and Robbins on the screen, that they agree to appear in roles severely lacking in personality. It's ironic then that a story that advocates the use of technology to assist as an emotional crutch for the elderly, be so completely devoid of heart.